Alison Plowden wrote many books only four that touched upon the English revolution. This was a shame because the subject was and still dominated by the male historian. Plowden writes in an engaging and thoughtful way. She once described herself as being "in the fortunate position of having been able to turn my hobby into a profession". "There must be thousands of women doing unsatisfying jobs who have a private interest or talent which could be turned to full-time and financial advantage… I do wish more of them would have a go." In this book she does appear to rely heavily on conservatives figures of the revolution, and especially there seems to be an over-reliance on the diary of John Evelyn. Plowden's background as a writer is interesting she came to write academic history from her experiences as a writer in television and a very successful one at that. Of this job she said "I could do better than this with my hands behind my back. Later on she said "A secretary writing scripts was a little like a performing monkey at the BBC - there was a sort of 'Fancy, what a clever little girl' attitude. She seems to have been well-liked among her fellow writers with historian and journalist Paul Johnson saying she “writes with verve, brevity and often wit; a most entertaining book which at the same time is accurate and judicious”. Plowden wrote four books on the civil war, The Stuart Princesses (1996), Women All on Fire: Women of the English Civil War (1998)Henrietta Maria: Charles I's Indomitable Queen (2001)In a Free Republic (2006). The Stuart Princesses, which examines the lives of the six princesses of the House of Stuart. Again the book is a well written and as one writer said she “combines detailed histories of the individual women into a single coherent narrative in a somewhat original way”. She followed up with the book Women All on Fire. This is a strong book in many ways. It is a valuable study of the women who played a significant political and social on both sides of the Civil War. While she had every right to write a book which mostly stems from a conservative and bordering of royalist historiography In a Free Republic – Life in Cromwell’s England, it does tend to be heavily critical of Cromwell's Republic. While it has been portrayed as looking at the reality of life in Cromwell’s England, it tends to be a little one-sided. In fact, it’s not so much what she writes it is what she chooses to leave out. 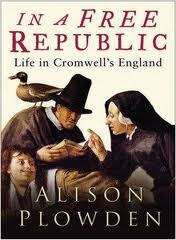 In A Free Republic does offer a revealing insight into everyday life during the interregnum, from 1649 to 1660. She makes heavy use of primary sources, particularly memoirs, diaries of the social commentator Samuel Pepys, letters, newspapers and state papers. Given that during this “free” republic press censorship was extremely heavy and any news had to get approval from the Secretary of State before publishing it is surprising that so many many primary sources are available to examine. Alison Plowden, who died on August 17 aged 75 said: “I’m in the fortunate position of having been able to turn my hobby into a profession”.There must be thousands of women doing unsatisfying jobs who have a private interest or talent which could be turned to full-time and financial advantage… I do wish more of them would have a go." The publication of this work in 1972 offered sixth-form pupils and first-year undergraduates a useful overview of the origins and causes of the English Revolution from the other side of the Atlantic. Since his move to Princeton in 1963, Stone had become increasingly interested in the work of anthropologists and political scientists just as he had been in the 1940s in that of economic historians and in the light, that such work might throw on long-standing historical problems. Whatever subscription he had once paid to the influence of Marx and Tawney had long since gone by the time in the late-1950s and early-1960s that he composed The Crisis of the Aristocracy, 1558-1641. Stone was certainly never a Marxist in the sense that Christopher Hill was. His early teaching at Princeton was, in any case, devoted, as the festschrift in his honour shows, to a survey course on the evolution of English society between c.1500 and c.1700. Stone certainly liked being at the centre of academic attention and of controversy, hence his production of works like this although it was also true to say that he had, by the early-1970s, become cut off from the main currents of academic research in England. The origins of Hugh Trevor-Roper’s dislike of Stone did not lie in the latter storming out of a revision class at Christ Church College in Oxford. In fact, the quarrel over the gentry arose from Hugh Trevor-Roper lending his transcripts on aristocratic indebtedness from the Recognizances for Debt then held in the Public Record Office in Chancery Lane. Stone used this material without Trevor-Roper’s permission and with the most misleading of indications as to how he had acquired it in his 1948 article in The Economic History Review. The controversy probably stimulated more interesting research into English history in the seventeenth-century than any before or possibly since. Hugh Trevor-Roper was a friend of Jack Hexter until the publication of Hexter’s essay, Storm over the Gentry, in Encounter in May, 1958. For several years thereafter, their friendship was in abeyance. Politically, they were very different indeed, as anyone who knew them both would understand. There is no significance in the funding of that magazine for their historiographical positions. The problem with Stone’s 1972 work was not just its use of sociological jargon like ‘multiple dysfunction’, ‘preconditions’, ‘precipitants’ and ‘triggers’ but also its antiquated analytical framework, its assumption that very long-term factors were at work, that the loss of landed possessions by the Crown and Church and, as he erroneously believed, the peerage made Revolution inevitable as the apparatus of Stuart rule failed to cope with the rise of the gentry, the spread of Puritanism, and the decline in the prestige of the Crown and Court and the Laudian church. Stone held that the political and religious history of the pre-Civil War period had already been written by S.R.Gardiner and C.H.Firth and fundamentally needed no emendation. He was profoundly wrong as Nicholas Tyacke and others were already demonstrating. Stone’s work on the origins and causes of the English Revolution was dated by the time it appeared in 1972. It belonged essentially to the 1950s and early-1960s. No amount of sociological dressing could make it fashionable again. By then, Trevor-Roper had written and published his ground-breaking essay on the Union of the Crowns. It was to the hypotheses about the significance of ‘multiple kingdoms’ that the future in 1972 belonged. The English Revolution in its International Context. I have been meaning to write something on this subject for a long time in fact since I first started writing this blog. Researching this topic was a challenge in itself in the sense that little of note has been written on the international character of the English revolution probably since Eric Hobsbawm wrote his Crisis of the 17th Century essay. With the posible exception of David Parker Europe’s Seventeenth Century Crisis and a few other books. In fact the only dissertation I found was called the Scottish Revolution in its International Context. The first part of this draft essay will deal with the two theories of the “general crisis of the 17th Century” and the response of historians today. The second part will place the English revolution in its broader international context more specifically events on the European continent including the beginnings of the Enlightenment influencing the philosophy of Thomas Hobbes who for me was one of the chief philosophers of the English revolution. While I generally agree with Eric Hobsbawm’s essay the general crisis of the 17th century, it should not be treated as the last word on the subject. It is a useful as a guide to deepen our understanding to the 17th century, which contained a large number of revolutions. It is important to bear in mind one piece of advice on this subject “the order and connection of ideas is the same as the order and connection of things”. While the revolutions in Europe had many differences, they also had some important similarities. Eric J. Hobsbawm's essay, which was printed in two parts in 1954, as "The General Crisis of the European Economy in the Seventeenth Century" and "The Crisis of the Seventeenth Century, II") sought to present a Marxist analysis of the transformation from a feudal society to a capitalist one in the 17th century. This transformation was held responsible for the revolutions, wars and social unrest that took place. Hobsbawm put forward that most of the social and economic structures associated with capitalism had grown and developed during "long sixteenth century." He believed that feudal “elements fatally obstructed growth” of capitalism He clearly believed that a revolution was needed to clear away the feudal rubbish in order for a new capitalist system to develop. The most pronounced expression of this process of was to be found in England. Another exponent of the “general crisis” theory was Hugh Trevor-Roper who opposed Hobsbawm Marxist approach for a theory that sought to explain the crisis from a Court versus Country standpoint. This also provoked heated discussion. Historians such as Roland Mousnier, J. H. Elliott, Lawrence Stone, E. H. Kossmann and J. H. Hexter in papers expressed all sorts of differences with Roper. An example of the heat generated came from the Italian Marxist historian Rosario Villari, "The hypothesis of imbalance between bureaucratic expansion and the needs of the state is too vague to be plausible, and rests on inflated rhetoric, typical of a certain type of political conservative, rather than on effective analysis.” He also accused Trevor-Roper of denying the importance of English Revolution. Villari believed that "general crisis" was part of an Europe-wide revolutionary movement. Along similar lines propounded by Hobsbawm. One writer took Ropers theory further when he explained, “The General Crisis of the Seventeenth Century" instead focused on confrontations that pitted the Renaissance fiscal, political, intellectual, and moral system ("court") against reform-minded opponents ("country"). This "crisis in the relations between society and the State" eventually spawned the Enlightenment and a range of radical, stabilizing, and indecisive political initiatives. Roper wrote not from the standpoint of a Marxist but he agreed with Hobsbawm that in the early part of the 17th century in Western Europe there was a substantial number revolutions which led to numerous break-down of monarchies and governments the cause was “a complex series of demographic, social, religious, economic and political problems “English Civil War, the Fronde in France, the Thirty Years' War in Germany and the disputes in the Netherlands, and revolts against the Spanish Crown in Portugal, Naples and Catalonia, were all expression of the same problems. Roper rejected the Marxist analysis of the crisis as a struggle of a rising capitalist class, which sought to replace the outmoded Feudal system. A significant number of English based historians I have to be honest completely ignored both Hobsbawm’s and Trevor Ropers theory of the “general crisis” and have a tendency towards” compartmentalisation" history of the English Civil war. With the exception of a few works, to the contrary this tendency has increased over the last few decades. It is tempting to blame solely revisionist historians over the last thirty years but that would be wrong because even among Marxist historians such as Christopher Hill who often apologized for not putting the English revolution in a European context. In fact, Ann Talbot was strident in her views of Hill’s weakness “that he always maintains an essentially national approach to the English revolution, which he does not place in an international context. In addition, that he has a tendency to romanticise the religious movements of the period and to be too dismissive of their rational intellectual descendants such as Newton and Locke. In part, these characteristics arise from the national orientation of his social class and reflect even in Hill vestiges of the Whig outlook that imagined a peculiarly English political tradition rooted in millennial seventeenth century visionaries like Bunyan that was entirely separate from Enlightenment thought. More significantly, it reflects the influence of the popular front politics and national outlook of Stalinism. With Hill, this is evident more in what he does not write than in what he does write“. In fact for well over three decades historiography on the English civil war or English revolution has a definite nationally centred approach. Books published in the last few years bear this out. Most recently Michael Braddick's book title God's Fury, England's Fire: A New History of the English Civil Wars, Barbara Donagan's War in England 1642–1649 (2008). Ian Gentles (The English Revolution and the Wars in the Three Kingdoms, 1638–52 ), all three books according to one writer “explicitly in its title sought to unite disparate approaches to the Englishness of the revolution and the British and Irishness of the wars as a whole“. Most of English historiography has concentrated on either regional conflicts as advocated by John Morrill or that the war was a” multiple kingdoms” conflagration. The war was solely a British affair. Other historians have concentrated on the role of religion in the Revolution but have a tendency to miss out on the role of the flood of refugees from the continent into London especially Protestants, puritans and most importantly Anabaptists who in no small way contributed especially to the growth of radical sect sects such as the Levellers and Diggers just to name two. Simply these have been a tendency to downplay to import of ideas from the continent. In fact, if historian or writer had an interest to centre the English revolution in any sort of international context he or she would come up against a coterie of publishers opposing this. There appears to be a marked “reluctance on the part of publishers to use any words other than a very familiar combination of English, civil and war. In addition, even the word revolution hardly ever appears now. Most of the current English historians have a tendency to down play the wider international context and the English revolution within which the political ideas associated with this intellectual and political movement developed and have a tendency concentrate heavily on their national expression. Not all English historians are little Englanders I must point to counter works Quentin Skinner, Martin van Gelderen and others have sought to place the English revolution in a more European centric mode although whether I agree that “scholars within the Anglo-American tradition now begin to see that the execution of Charles I was not just the starting point for the English Revolution but also the "last act of the Thirty Years War” is another matter and would be the setting for different essay. This brings me to the second part of this essay. Thomas Hobbes I believe was very much a child of the Enlightenment and played a key role in the development of a materialist philosophy. Hobbes was a writer clearly influenced by European political and philosophical developments and they in turn influenced his philosophy it was a dialectical arrangement. While Israel is no Marxist it would be advantageous to quote probably the foremost Marxist today. While David North has said, it is a matter of contention as to when it began and even what it consisted “the Enlightenment proper refers to a period of several decades in the eighteenth century, approximately from the 1710s to the 1780s. However, historical periods do not always lend themselves to such simple chronological classification. The Enlightenment, conceived of as the expression of a profound broadening of man's intellectual horizons, must certainly be seen as the extension and outcome of the extraordinary advances in science that had, over the previous two centuries, fundamentally altered man's conception of the universe, the place of the planet Earth in the universe, and the place and role of human beings on that planet. “Until the early seventeenth century, even educated people still generally accepted that the ultimate answers to all the mysteries of the universe and the problems of life were to be found in the Old Testament. But its unchallengeable authority had been slowly eroding, especially since the publication of Copernicus's De Revolutionibus in the year of his death in 1543, which dealt the death blow to the Ptolemaic conception of the universe and provided the essential point of departure for the future conquests of Tycho Brahe (1546-1601), Johann Kepler (1571-1630) and, of course, Galileo Galilei (1564-1642). Intellectually, if not yet socially, the liberation of man from the fetters of Medieval superstition and the political structures that rested upon it, was well under way“. He continues, “The discoveries in astronomy profoundly changed the general intellectual environment. Above all, there was a new sense of the power of thought and what it could achieve if allowed to operate without the artificial restraints of untested and unverifiable dogmas. Religion began to encounter the type of disrespect it deserved, and the gradual decline of its authority introduced a new optimism. All human misery, the Bible had taught for centuries, was the inescapable product of the Fall of Man. However, the invigorating scepticism encouraged by science in the absolute validity of the Book of Genesis led thinking people to wonder whether it was not possible for man to change the conditions of his existence and enjoy a better world. The prestige of thought was raised to new heights by the extraordinary achievements of Sir Isaac Newton (1642-1727) who, while by no means seeking to undermine the authority of God, certainly demonstrated that the Almighty could not have accomplished his aims without the aid of extraordinarily complex mathematics“. As was said earlier one the most important English philosopher to be influenced by continental ideas was Thomas Hobbes (1588-1679). Hobbes perhaps the main philosopher of the English revolution was found on the Royalist side that put forward a materialist philosophy, supported Charles 1st and was a supporter of absolute monarchy. The Thirty Years War dominated most of his adult life, which was the bloodiest European war until the twentieth century. An estimated 30 percent of the population of what is now Germany was killed. He grew up in a world that that was truly being turned upside down. France was being ripped apart by the Fronde.In England 1640s; two civil wars consumed England, Scotland and Ireland. The Thirty Years War certainly influenced Hobbes view of the nature of the state of in chapter 13 of Leviathan according to Ann Talbot “he describes the life of man in a state of nature as “solitary, poore, nasty, brutish and short.” The state of nature was the condition into which human society fell when civil society broke down. For Hobbes, the state of nature was not an abstract, theoretical construct, it was something that existed in large parts of Europe and could cause him to alter his travel plans“. It would be wrong however to perceive Hobbes as an isolated individual philosopher who was rejected by his contemporaries and who was without influence even during his own time. It is true that his writings came under fire precisely because they were regarded as not only dangerous but as in the introduction to the pelican version of Leviathan edited by C B Macpherson “they thought it dangerous because of the widespread acceptance it was attaining amongst the reading classes”. One biographer asserted in 1691 that Leviathan had “corrupted half the gentry of the nation”. He was also widely read abroad especially in France where his ideas were to influence French enlightenment thinkers. Pierre Bayle in his Dictionary was to describe Hobbes as “one of the greatest minds of the Seventeenth century”. While in France Hobbes met the physician Sorbiere who did the first French translation of De Cive. Hobbes played an important part in laying to foundation of the Enlightenment his most important work Leviathan written in 1651 was one the first study of what the early modern bourgeois state should look like. He sought to lay down a set of scientific principles on which to base that state. Hobbes was no democrat. His kind of state would be an absolute monarchy. He recognised that man had basic desires, to live and to avoid pain. Perhaps his most famous of phrases was that the life of man is solitary, poor, nasty, brutish and short. In order to overcome this “war against all”, he put forward that men must give up their freedom to pursue any goal they wish and form some kind of compact with the state. That they accept a common power, which enforces laws. This would be government or as Hobbes wished a monarch. To many these ideas were new and somewhat dangerous. Important to Hobbes was the idea of an absolute form of authority and along with his ideas on religion faced its most criticism. Hobbes saw that at the heart of most problems in England was religion. He proposed that there would be a national religion in which the sovereign was head. Hobbes was against the Roman church and he saw all independent churches as an obstacle to his goal of a national church. According to G A J Rogers ” Hobbes materialism everything is either body or it is nothing and his mechanical determinism soon brought a charge of atheism. Although it would be wrong to regard him as strongly religious there is, no reason to doubt his claim that he was an Anglican, albeit with Calvinist leanings. He is often regarded as sanctioning absolutism, but he would reply that all he had done was to describe the way in which societies actually work and that unless was recognised the outcome would be disorder and social disaster. While his philosophical writings were more important that his religious leanings. Their impact was to be momentous. His thoughts and emotions were product of his environment. Ideas remained in his brain long after they had been first stimulated. According to Hobbes, words are wise men’s counters, they do but reckon by them but they are the mony of fools. He believed that words must never be allowed to take a life of their own. The universe is corporal, body…. And that which is not body, is no part of the universe according to #Roy Porter the implications were momentous, no spirit, no lords spiritual. It is hard to separate Hobbes political views from his philosophical ideas. He drew definite conclusions from the civil war. In many ways, he saw that the war, which ripped England apart, was very much down to the spread of ideas embodied in enthusiasm. He likened their ideas to a kind of madness that emanates when passions like vainglory or melancholy. His abhorrence of the puritans is clear from his writings particularly his Leviathan#. According to #Frederick C Beiser “the ultimate source of enthusiasm, Hobbes is convinced, is the same as that for all human actions, the desire for power. Whether he is aware of it or not the enthusiast attempts to dominate people. He claims divine inspiration to win the allegiance of a superstitious multitude: and then he promises them eternal happiness if they obey his dictates”. It is certainly true that Thomas Hobbes’s approach to the matter was a mirror reflection of the fact that the growing English bourgeoisie still required the services of a strong monarchy. The simple reason for being capitalist social relations were not yet the dominant feature of English society “ As Marx and Engel’s put it in the Communist Manifesto, the bourgeoisie of the manufacturing period were a class that served “the semi-feudal or the absolute monarchy as a counterpoise against the nobility, and, in fact, cornerstone of the great monarchies in general”. Men such as Thomas Wolsey, Thomas Cromwell and Thomas More, played that role for Henry VIII, as Nicholas Bacon was to do for Elizabeth and Francis Bacon for James I“. Hegel writing in one of his lectures said that Hobbes maintained, "The origin of all society is to be found in the mutual fear of all its members;" it is hence a phenomenon in consciousness. "Each association is thus formed in its own interest or for its own renown, that is, from selfish motives." All such matters as security of life, property, and enjoyment, are not to be found outside it. "But men have in all dissimilarity of strength a natural similarity as well." This Hobbes proves by a characteristic reason, viz. that "each individual can make away with the other," each is the ultimate power over the others. "Each can be supreme. Thus their similarity is not derived from the greatest strength; it is not, as in modern times, founded on the freedom of the spirit, or on an equality of merit and independence, but on the equal weakness of mankind; each man is weak as regards others“. He believed that psychology was the source of knowledge rather than epistemology. He was interested in the problem of sense perception and developed Galileo’s mechanical physics into an explanation of human cognition. Hobbes was certainly connected profoundly with what was to be a massive leap in political and scientific knowledge, which in a matter of decades would see the dissolution of the medieval worldview to be replaced by one based on science and reason. The previous one having given humankind somewhat limited understanding of his place in the universe. · CromohsVirtual Seminars : German Historians and the English Revolution: 17th and 20th Century Gaby Mahlberg University of East Anglia in M. Caricchio, G. Tarantino, eds., historiographical trends of the British Studies (17th-18th Centuries), 2006-07 http://www.cromohs.unifi.it/seminari/mahlberg_german_historians. · Braddick Michael, God's Fury, England's Fire: A New History of the English Civil Wars, (London: Allen Lane, 2008; pp. xxvi + 758. £30). · Hegel G. W. F. Hegel: Lectures on the History of Philosophy. Thomas Hobbes. The first thing that strikes you upon reading this book is that it despite its size, just over 177 pages Stone in a roundabout way does present a convincing case on the causes of the English Revolution. After the book was published in 1972 it encountered heavy criticism “for its use of sociological jargon”, but it was also praised because it “presents a praiseworthy attempt to differentiate the layers of causation in complex events“. Stone admitted later that he would no longer use ambiguous words such as “multiple Dysfunction.” That said it would be correct to say the book is a minor classic and has impacted on students regardless of the controversy. The book is a defence of Stone’s old line on the Civil War. It is broken down into two parts with four chapters; the fourth is an update on Stone’s previous position written in 1985. Part one is titled Historiography subtitled Theories of revolution. Stone works through some sociological and Marxist theories as to the revolutionary nature of the English Civil War. Stone’s enquiry on the nature of the English Revolution was prompted by his time at Princeton University in America. While teaching at Princeton, he came under great attack by his students for his leanings towards a social/economic read Marxist interpretation of the Civil War. My own criticism of him is that he never actually says what he thinks at this time and his definition of what a Marxist theory of the English Revolution should look like. Much of his defence of Marx and Engel’s is limited and opens the door to attack from the revisionists. Stone admits himself that he enjoyed his work at Princeton and one writer describes this impact “ When Lawrence Stone arrived in Princeton and unpacked his intellectual baggage, he released a fresh set of ideas, which are still buzzing in the air, not merely here but everywhere in the country," said his colleague at Princeton, Robert Darnton. "History, as he presented it to rapt audiences of students and colleagues, cannot be confined to the tiny elite who dominate events. It involves entire populations. To be understood adequately, it requires some mastery of demography, economics, and political science. To be brought alive, it should be narrated in a lively style, seasoned with amusing anecdotes and provocative arguments -- the more heretical, the better. Lawrence was always in a scrap, always making the fur fly and the ideas soar. He set the pace in what emerged in the 1960s as the new social history, and he remained our pre-eminent historian until the day of his death." 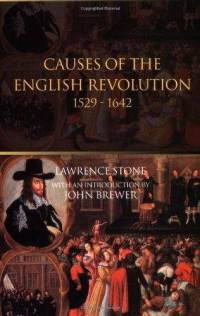 Lawrence Stone’s main argument in his 1972 Causes of the English Revolution is that “the dissolution of the Government caused the War, not the War the dissolution of the Government.” Stone in the book outlined certain “pre-conditions for revolution” in the period from 1529 to 1629. This long view of the English revolution came under sustained attack during his lifetime and unfortunately remains so today. It doubtful that during the last ten years any book on the subject of the English revolution has contained any analysis of long-term causes of the revolution. While his book retains an excellent academic level, his writing is clearly meant for a wider audience. He communicates this to his audience within the words of Christopher Hill’s “with gusto”. In many ways, this best show the best and the worst of Stone. His best is a passion for trying new things and methods. He had a knack for finding which things were real and therefore rational and those which were passing fads. For Hill “Lawrence Stone’s deep curiosity, his enthusiastic if critical appreciation of what is novel, and his courteous and tolerant if a trenchant statement of disagreements makes him and good reviewer. He has a gift for summing up epigrammatically what most of us would say in several laborious pages”. In Stone’s Causes of the English Revolution, he admitted that using this approach sometimes caused him to make mistakes. The mark of a good historian is first to limit as much as possible their mistakes but once made to admit them and they attempt to correct them. Stone did both of them. But this did not stop the unwarranted and downright vicious attacks on him and his work. Perhaps the most public historical spat occurred when he became embroiled in the controversy the "Storm Over the Gentry". In 1948, became close to the historical positions of R.H. Tawney who in turn encouraged Stone to publish the article in the Economic History Review entitled "The Anatomy of the Elizabethan Aristocracy." Stone met Tawney during the war who was the leading social historian of Tudor and Stuart England. It was during this period he discussed research projects. It was also during this time that according to the National Oxford Biography of Stone “His impatience to get on with ‘real’ history earned him a reputation for arrogance during his post-war undergraduate year; on one occasion he stormed out of a revision class conducted by a newly appointed Christ Church tutor, Hugh Trevor-Roper. It would appear that Roper never forgave him for this but does not explain Roper's vitriolic attack. Trevor-Roper accused Stone of failing to understand the technological nature of the documents he studied and had substantially exaggerated the level of indebtedness of the Aristocracy. See also C Thompson Critic of Stone’s work) This ‘mistake’ did not warrant Roper’s “academic vituperation”. Tawney was moved to defend Stone saying that ‘an erring colleague is not an Amalakite to be smitten hip and thigh’. The problem with the paper was that it was too hastily written and contained some inaccurate information. On a broader point while Stone himself described his early career as being a young Marxist perhaps his mistakes were the product of an incomplete assimilation of the Marxist method of Historical Materialism. Stone had a major problem in that he never really understood the difference between genuine Marxism and a crude form of economic determinism. In fact, Stone himself soon moved away from any link with Marxist historiography and in his own words became as he put it in an interview in 1987, "an old-fashioned Whig". While Stone repulsed this attack from Roper the feeling I get reading this book is that he really never understood the political nature of Ropers and other conservative historians attack his work. While it is true that Stone acknowledged the historian E H Carr "Study the historian before you begin to study the facts, and what bees he has in his bonnet. When you read a work of history, always listen out for the buzzing. If you can detect none, either you are tone deaf, or your historian is a dull dog. Stone never really deepens the reader's knowledge of the political persuasion of Roper or other historians such as J H Dexter who Stone describes as a Liberal. While Hexter’s work is very readable here is not the place to evaluate its merit, but it does warrant me to say that Hexter’s close links along with Roper to the American Encounter magazine which had close ties to the CIA could have been exposed to Stone. In the 1950s Hugh Trevor-Roper went to a conference in Berlin which was mostly made up of anti-communists, I am not sure if J H Hexter went to as well but writer and some Stalinist intellectuals such as Sidney Hook, Melvin J. Lasky, Ignazio Silone, and Arthur Koestler. The result of this conference was the founding of the Congress for Cultural Freedom and its magazine Encounter. Trevor-Roper wrote extensively for the magazine Encounter, is it any wonder that Stone who was mistakenly described as a Marxist historian would feel the brunt of Roper’s tongue. This would in my opinion armed his readers with an understanding of the fact that attacks on Stone’s work were not just motivated by historical accuracy but had a very right wing political undertone. The attack on Stone was unwarranted for some reasons. The main one being that after writing the Cause of the English Revolution he was moving away from any link to a Marxist analysis of the English Revolution. Whether Stone was ultimately influenced by his detractors and therefore changed his theory of the revolution cannot be determined, but he quite profoundly moved away from a semi-Marxist standpoint adopted the French concept of history totale, ’. (I have put a link in my sources from Wikipedia on the French School.) According to one writer “It was during this period “Stone was part of a group of young historians who prised the infant journal Past and Present loose from its Marxist origins to become the flagship in Britain of the new social history“ In 1979 he astonished readers of Past and Present with an article, ‘The revival of narrative’ (reprinted in The Past and the Present Revisited, 1987), which sharply attacked the dehumanization implicit in much quantitative or ‘theoretical’ history, advocating instead the accumulation of masses of small-scale anecdotal material. Interspersed with this work was a steady stream of serious journalism, analysing and frequently finding wanting current historical scholarship.